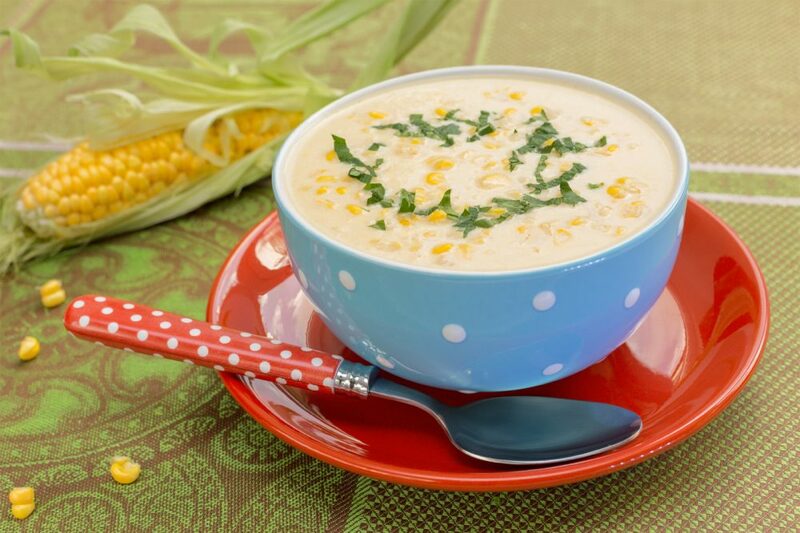 This is a great autumn/winter corn soup that can be stored for a few days and tastes great. Shuck the corn by holding each ear of corn vertically over a baking sheet, use a sharp knife to slice off the corn kernels. Remove the stem and seeds. Then dice the pepper into small pieces. Mix the corn, the diced pepper with the olive oil and salt in a bowl, spread evenly on the baking tray. Bake for 25 minutes, stirring a couple of times. Remove the tray when the corn just starts to brown. While the corn is the oven, cut the cobs centers into 4 pieces and place them in a saucepan with the water. Bring the water to a simmer. Reduce the heat and let cook for 30 minutes. Melt the butter in a large saucepan, adding the onions and garlic on a medium heat, stirring for 6 to 8 minutes. Then add the roasted corn and peppers to the pan. Strain the corn cob liquid into the pan. Add the paprika and bring the soup to a boil. After simmering for 5 minuets add the milk, cream and splash of salt. Cook the corn soup for a further 3 to 5 minutes then serve. Add basil to taste. To further the smokey flavor that the paprika adds, chop and fry up some smoked bacon to add that something extra!